Timothy Bradley defeated Juan Manuel Marquez in a Split Decision and successfully defended his WBO welterweight belt against Juan Manuel Marquez!Judges scorecards were 115-113 (Marquez), 115-113 (Bradley), 116-112 for the winner by split-decision. 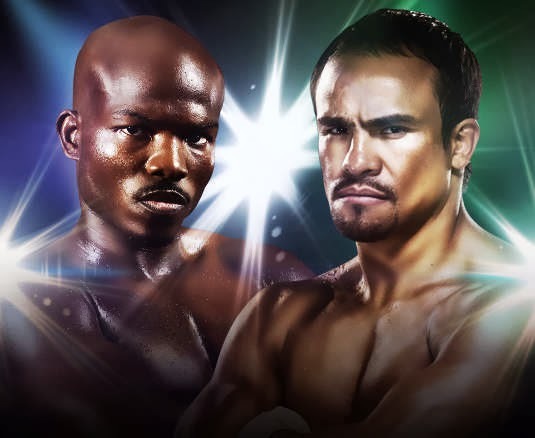 The Timothy Bradley vs Juan Manuel Marquez is on the line of the boxing arena. Timothy Bradley vs. Juan Manuel Márquez is for the welterweight championship fight The bout will be held on October 12, 2013, at the Thomas & Mack Center in Las Vegas, Nevada, United States on HBO PPV. In the Philippines, the fight will be on live and broadcasted by the GMA network. This is fight is more than a much exciting fight, Bradley will be defending his WBO welterweight title against the not old but dynamic "dinamita" Marquez who is believe more than a hulk can do in boxing stage as what he did to Philippine's boxing icon Manny Pacquiao. The video replay highlights of this Bradley vs Marquez fight will be available after the fight live right away in this post. Consider that the Bradley vs Marquez will be the candidate for the fight of the year if the two will able to get things done according to what sweet boxing is all about. Whom do you favor for this fight? Some boxing fans, find MArqeuz will able to pull the victory but I'm kinda disagree, I would favor Bradley for this fight simply because this is is fight - where Marquez is not a that great of pressuring his opponents. Bradley as a universal boxer, successfully won over aggressive and counter puncher boxers while Marquez is very successful in agressive boxers like Manny Pacquiao but he fell to counter puncher boxer just like him namely, Floyd Mayweather. But let see what will happen in when the lights of boxing ring will start unto their rounds. According to Ryan Bivins of sweetboxing, Juan Manuel Marquez is a great fighter. But he's only great going in one direction - backwards. If Bradley forces Marquez to chase him around the ring it's going to be a major problem for Dinamita. And while Bradley doesn't usually fight that way, it is in his skill set. So who do you favor in a fight like that, a 30 year old or a 40 year old? I'm going with the 30 year old "Desert Storm." It also doesn't help Marquez's cause that he's compared this fight to two bouts in which he's lost (his pro debut and first world title shot against Freddie Norwood). Marquez had to chase Norwood back when he was only 26 and couldn't get the job done then. It was a controversial decision, sure, but I scored the fight for Norwood and I know Bradley can do just as well if not better. According to Tom Craze, Boxing's forever-misleading triangle theory tells us that Pacquiao looked like he outpointed Bradley, before Marquez well and truly cleaned his clock. Realistically, it means little, of course. What's more pertinent, perhaps, is that Marquez - truly one of the great technicians of the past couple of decades - is coming off a career-best, ghost-laying win, while Bradley may never quite be the same after willingly and repeatedly getting punched in the head back in March. It may not matter, of course - Bradley's will to win is so impressively steadfast it's almost disconcerting, and the words '40-year-old, ten-month-inactive Marquez' raises obvious doubts. So what's you fight prediction for this fight? Will you be able predict and choose your prediction to be right? Whatever your predictions is, sometimes predictions tells the truth but not at all times. I can see Timothy Bradley wins this fight via decicion and I can predict that Marquez will be able to pull the victory via KO. At least I'm not one sided to this particular boxer, whatever the results would come out, let's be excited the real fight results of Bradley vs Marquez after the fight. Note that the Bradley vs Marquez fight video replay highlights will be available in the next couple of hours. I hope you enjoy watching the video replay highlights of Bradley vs Marquez. Till next fight boxing installment for this year. Please like our page on facebook.